Photographs by Victoria Rolf unless otherwise acknowledged. 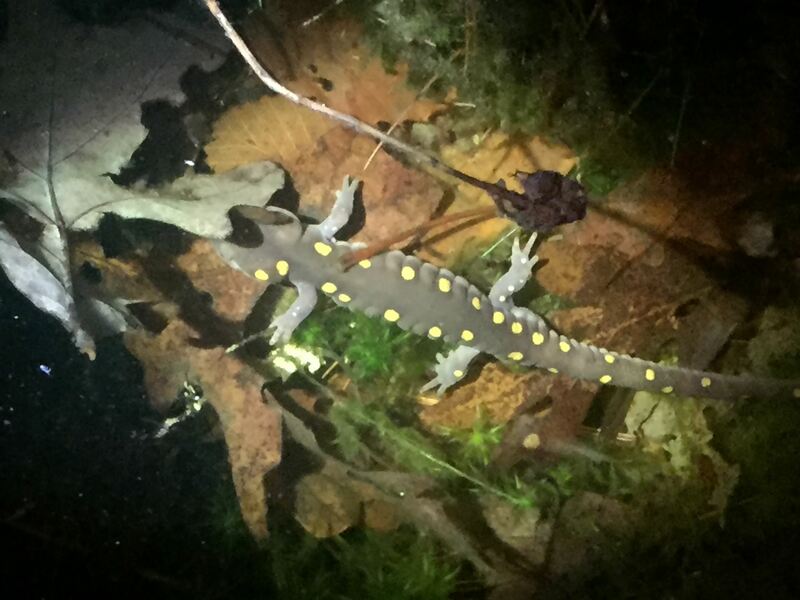 About ten of us ventured out tonight to join Rick during the second Nighttime Vernal Pond Field Trip this year. We were all excited and trying to anticipate what we might behold. 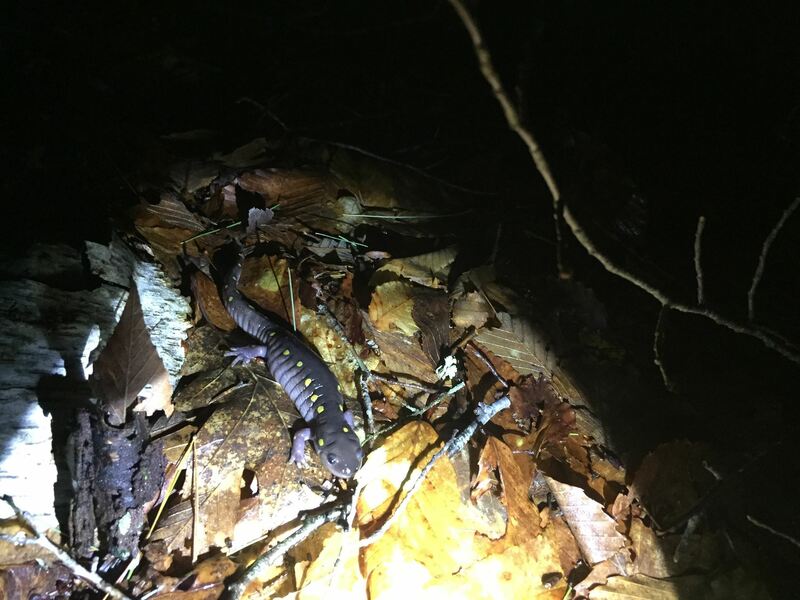 We hiked just about a quarter mile into the woods watching the ground closely with our flashlights so we didn't crush any little animals migrating. It was pretty wet, cool and windy but once we got into the woods we were blocked from the wind and it was really nice. Our ages ranged from ten to about 80 - most were newbies. 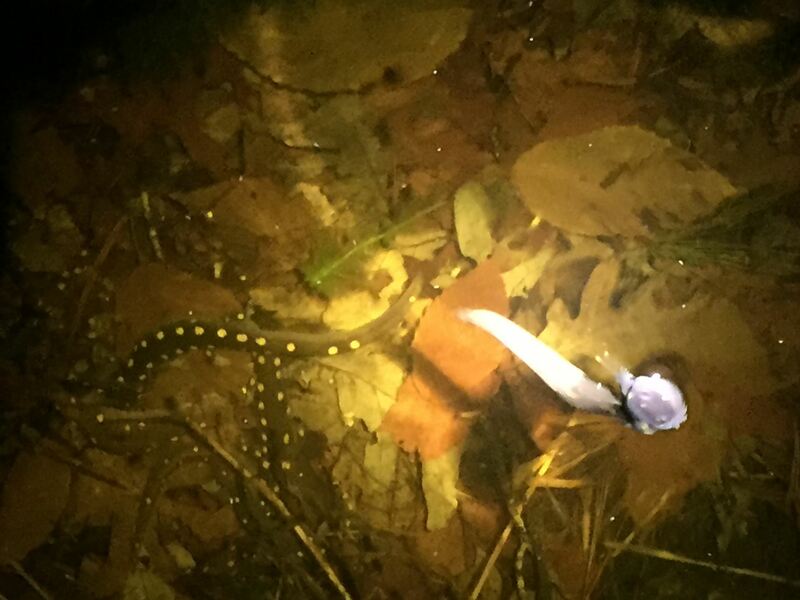 We saw five Spotted salamanders heading to the pool and congressing madness in the pool. 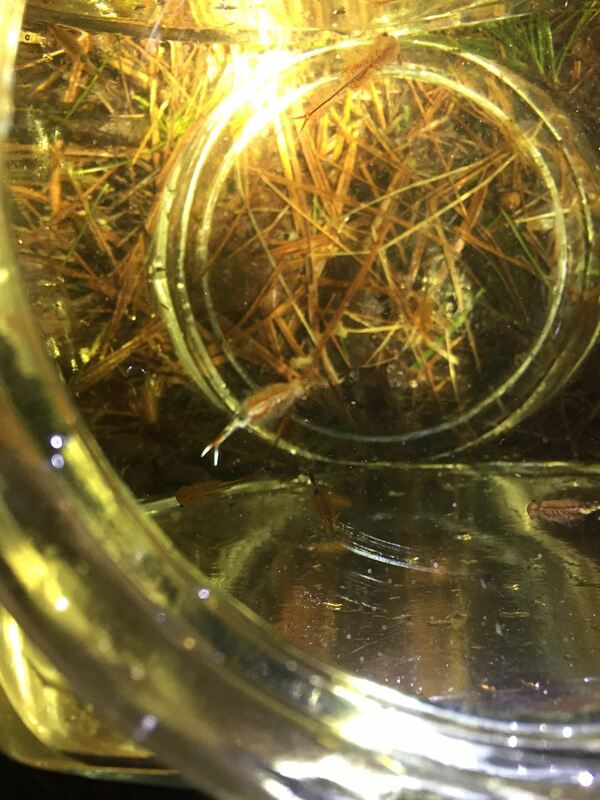 We also heard a few Wood frogs but didn't see them along with some fairy shrimp and a few bugs. 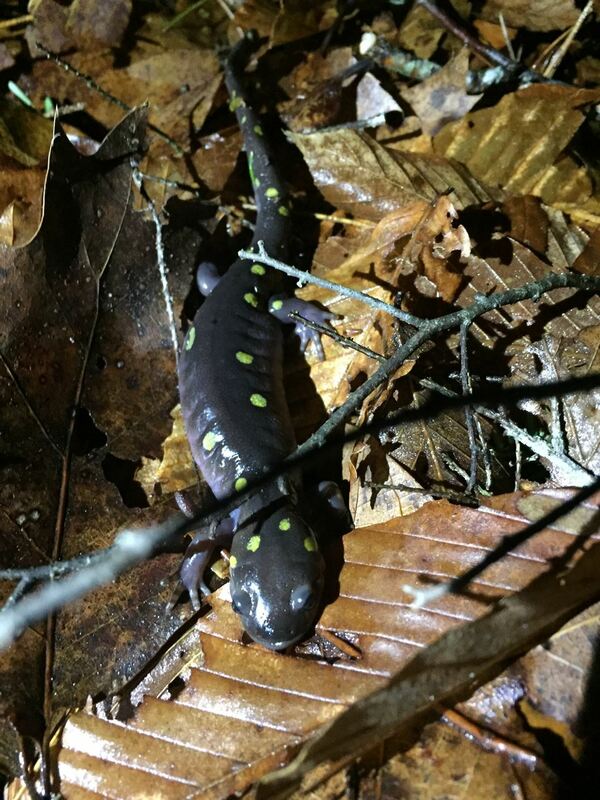 Kasey Sampson who joined us for her first Nighttime Vernal Pond Field Trip tonight! 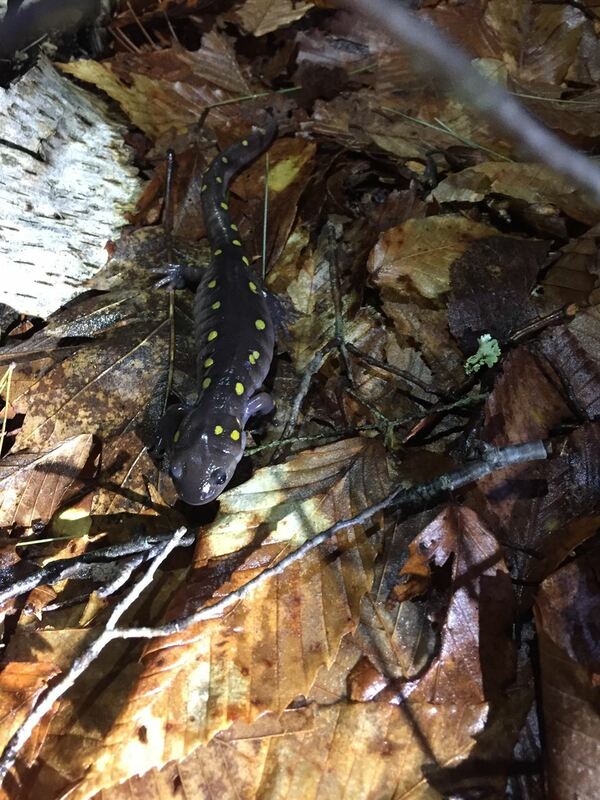 Check out the cells along the sides of the Spotted salamander body above. Pretty cool looking. And did you know the spots are uniquely patterned on each individual? Below and to the right, these Sallies are working their way to the pool... it's about ten feet away. 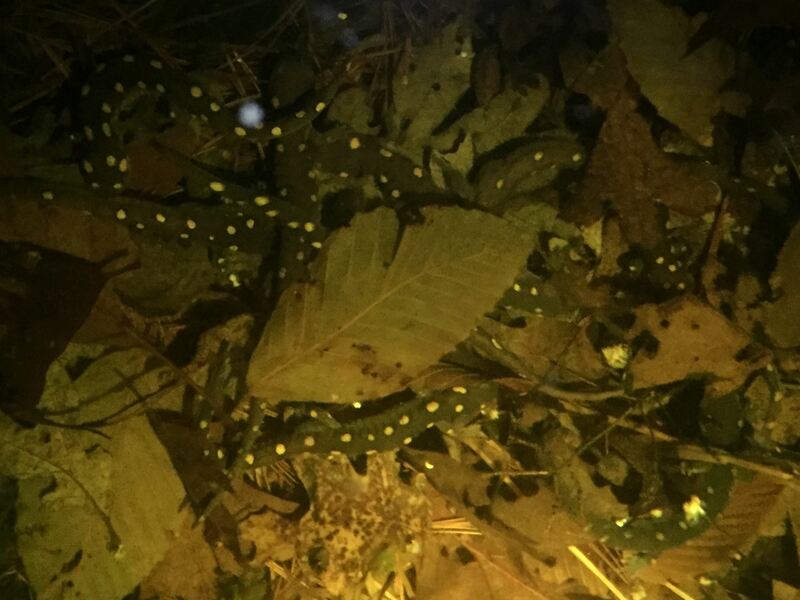 Notice something on this submerged Spotted salamander below? See the swollen area behind the rear legs... this is a male full of spermatophores and ready to lay them on the vernal pool floor. 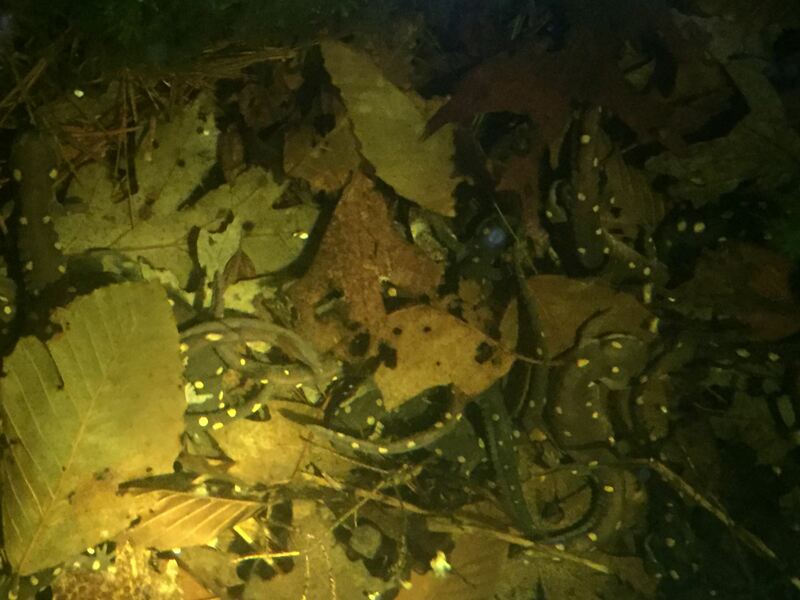 We were so lucky we got to see hundreds of swirling, thrashing, and breeding Spotted salamanders tonight. What a treat. Everyone was so happy and amazed. One of the ten year olds said it was the best night of her life. One of the twenty year olds said she wanted to stay all night. 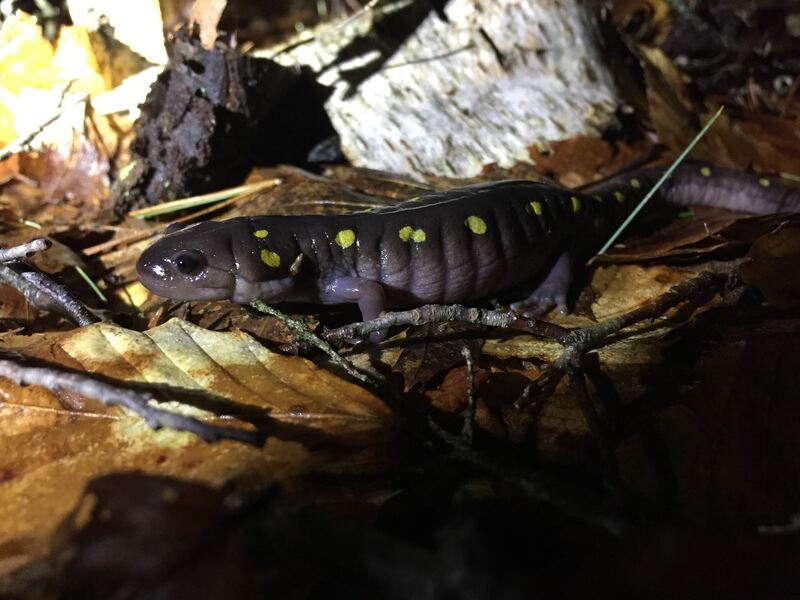 During the March to April breeding season, the males come out of hibernation ahead of the females by a day or two and arrive at the vernal pools first. There they form large clusters of writhing males called congresses. As females arrive, individual males will separate from the congress and perform a courtship dance with a female. They will circle and put their heads under one another's tails. The male may climb on the female's back and rub her with his chin. The male will then swim away wiggling his tail and the female may decide to follow. He leads her to spermatophores he deposited earlier on submerged leaves on the pool's bottom. The female squats over the spermatophores and picks them up through her cloaca, the opening amphibians use for breeding and laying eggs. The female may pick up spermatophores from more than one male. Fertilization of her eggs takes place internally. Then she lays her egg clusters on leaf litter or vegetation at the bottom of the pool. The following photographs aren't very clear since they're through the water at the bottom of the pool and there is so much frenzied movement. But you can see there are a lot of them in a small space. The bottom photo shows one of the males coming up for air. There were so many of them and they sure didn't come up very often so they don't have to breathe frequently. The Fairy shrimp are quite beautiful. They swim upside down and are amazing to behold. Rick brought a fish jar so we could look at them from the side while the swam about. You can pretty much see right through them and catch all the invertebrates detail. We also got to see Springtails, or more commonly snow fleas. The name is derived from the furcula on the abdomen which acts like a spring when released. It moves the Springtails a pretty fair distance. 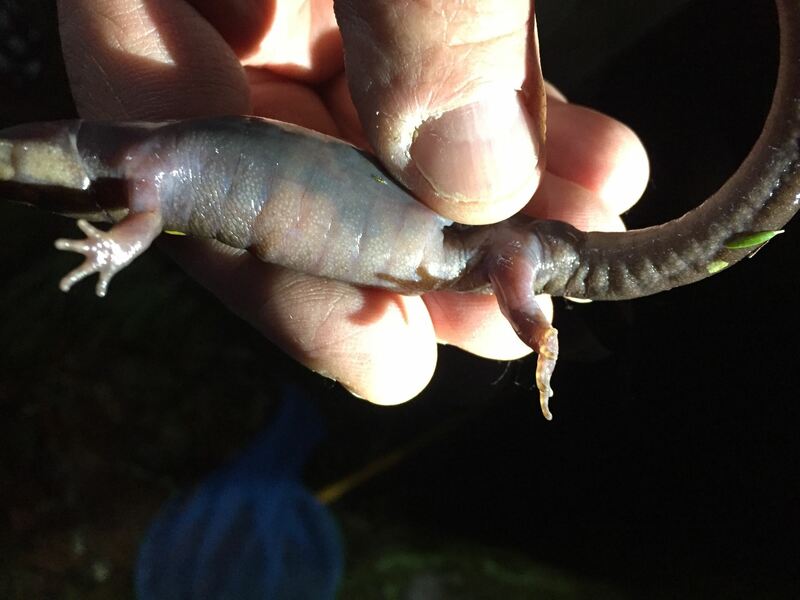 They are wingless anthropods which are aquatic or semiaquatic and can be found on vernal pool surfaces feeding on microorganisms.